Closet Renovation: Plano Texas Handyman Services has expert knowledge in renovating your closet. Do you have a closet in complete disarray? Do you want to the ultimate in closet organization? 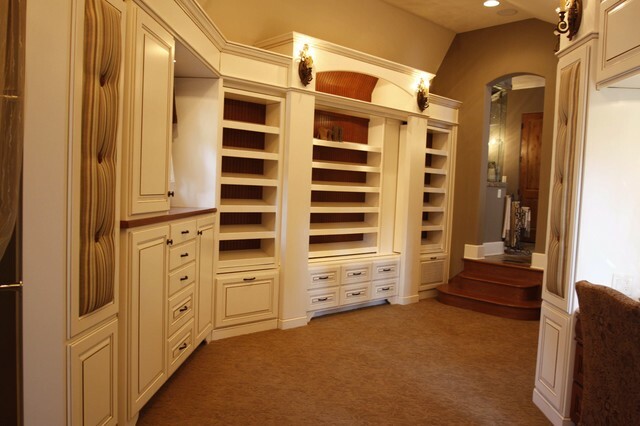 Call Plano Texas Handyman to design and install the perfect master bedroom closet system. No matter what kind of closet you’re planning, take the time to think ahead and really consider what you need to store and where you want to store it. Taking a hard look at what you have will help you understand the kind of storage you need. Closet Renovation. Contact Plano Texas Handyman at 214-507-3415 and ask for Ted or visit our website for all our capabilities. Closet Renovation. Closet Organization. Choose a line of quality cabinets and a respected company to do the installation. Designate a staging area and empty your closet out. You can use your bed or a cleared-out corner of the room. This important first step requires you to remove everything: clothes, hangers, boxes, folded blankets or piles of old magazines. Use a collapsible clothing rack to hang clothes so you can clearly see and sort exactly what you have. The rack is a nice addition for your laundry room once the closet project is over. Take your time with this process, maybe play some of your favorite music and ask Ca friend or family member to help if heavy items need to be moved. Closet Renovation. Closet Organization. During this stage, take the time to group small items like batteries or toy soldiers together in bags or jars, so they don’t end up “lost” among the boxes or piles of larger items. Closet Renovation. Closet Organization. Eliminate items that don’t belong in that particular closet. One of the big causes of clutter and disorganization in the home is items that belong in the kitchen or bedroom, are found hiding in closets all over the house. Over time, the temptation to stuff something like a box of appetizer plates in a bedroom closet or extra towels for the bathroom in the entry closet can cause you to make some bad storage decisions. This is the time to return out-of-place items to their rightful home. But try to stay focused on planning one closet at a time. You can turn your attention to other closets at a later date. Closet Renovation. Closet Organization. Clean the closet itself. While you might think an empty closet is “clean”, now is the time to wipe down the closet walls and vacuum or mop the closet floor. Once items are removed, you will probably find stray clothing tags, store receipts or dust bunnies. If the walls need painting, choose a paint that is specifically formulated to be mold and mildew-resistant. If you find your closet walls have mildew or mold after you remove items, have a professional examine your walls and properly clean and paint them. Closet Renovation. Contact Plano Texas Handyman at 214-507-3415 and ask for Ted or visit our website for all our capabilities. We will review all the possible options and design and install the perfect system to make your daily routine an enjoyable experience. A well designed closet creates efficiency in the fact that you can utilize your clothing and clothing options (including accessories: belts, shoes, scarves, handbags, and other items) more effectively by combining otherwise unused items to create a wardrobe bonanza. Closet Organization.